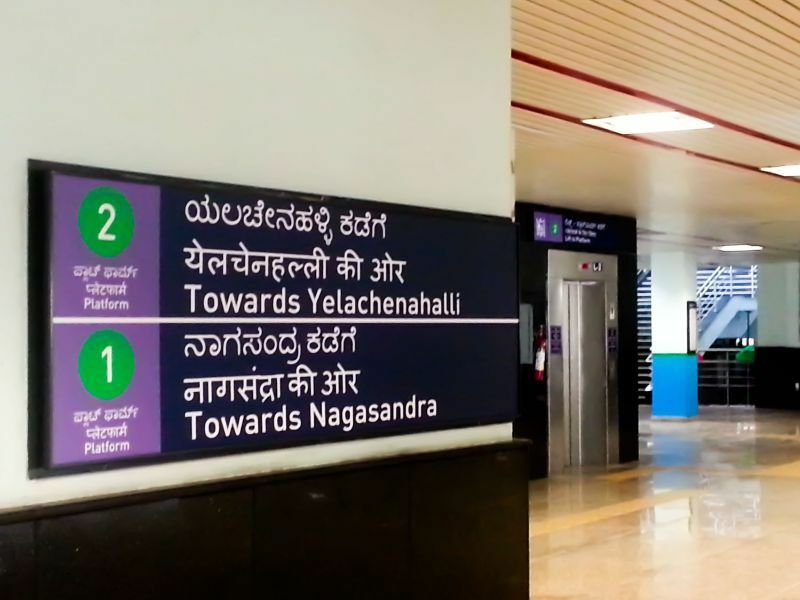 Recently, there were reports of anguish amongst Bengaluru residents at what they perceive to be imposition of Hindi at the cost of Kannada because some Hindi signboards propped up on the ‘Namma Metro’ of Bengaluru. Prior to that there were reports of a similar sense of discomfort at road signs in Hindi in Tamil Nadu. But are these often thrown charges (some tried to see the same Hindi imposition in design of the new notes too;backed by a genuine sense of alienation of the local languages? The answer is NO. If one sees the various photographs being shared actively on social media by those showing their disgust at the use of Hindi in the Bengaluru Metro, one can see quite clearly that nowhere is Kannada found to be missing. Rather the signboards are seen in three languages- Kannada, English and Hindi. So if Kannada is perched right up on the signboards alongside the other two languages, how in the world is Hindi superseding Kannada? How does the question of ‘imposition of Hindi’ at cost of Kannada even arise? Let me clarify at the very outset that I’m all for local languages. If Kannada indeed was missing from the sign boards, I would agree 100% with the social media campaigners that this was wrong and support them in their agitation to get Kannada included. A similar stir was witnessed in Mumbai a few years ago when Raj Thackeray argued that Marathi was missing from the names of most private shops and hence all signboards must include Marathi as well. what harm could there be if another very much Indian language (i.e. Hindi in this case) too is a part of the directions and signboards in the Namma Metro? Let us examine it from the legal perspective as well. Bengaluru Metro Rail Corporation (BMRCL) is a joint venture of the central and state governments. According to the Constitution, Hindi in Devanagari script and English are the two official languages of the Indian Union. While English was initially stipulated to be the official language for 15 years only, vehement protests by the non-Hindi speaking states ensured that English continued to enjoy the status of an official language post 1965 as well through the Official Languages Act of 1963. So, if English has a right to be there on the signboard, Hindi has very much the same right to be used. Legally, there is nothing wrong with it. Even from a pragmatic perspective, such protests are essentially futile. In Mumbai all signboards are placed in three languages- Marathi, English and Hindi, in Delhi there are four languages- Hindi, English, Punjabi and Urdu. Bengaluru is one of the most cosmopolitan cities in India and attracts people from around the country. So what harm could accrue merely by the use of a particular language in the metro? Respect for local languages is a must as India is a uniquely diverse country, with no national language, 22 scheduled languages and thousands and thousands of other languages and dialects in use. Neither do I mean any disrespect to the regional languages, nor do I say that stop using and learning English and have only Hindi. In today’s era of globalisation, a good command on English is an asset. Also, each and every one of us must also learn to speak, read and write his or her mother tongue as well, to ensure that the abundant literary treasures in them continue to be cherished and expanded. All I want to point out with this article is simple- let’s not make a controversy where none is present. While I personally favour having a certain language as the national language, at present it is a bit of a tricky issue and there need to be wide ranging consultations amongst various stake holders on how we could go towards adopting a common national language….